Maro Beach, Playa de Maro, also known as La Cala de Maro deserves a special mention in any best beaches in Nerja list. Its crystal clear waters, easy access and unbeatable scenery make Maro Beach a firm favourite for many. 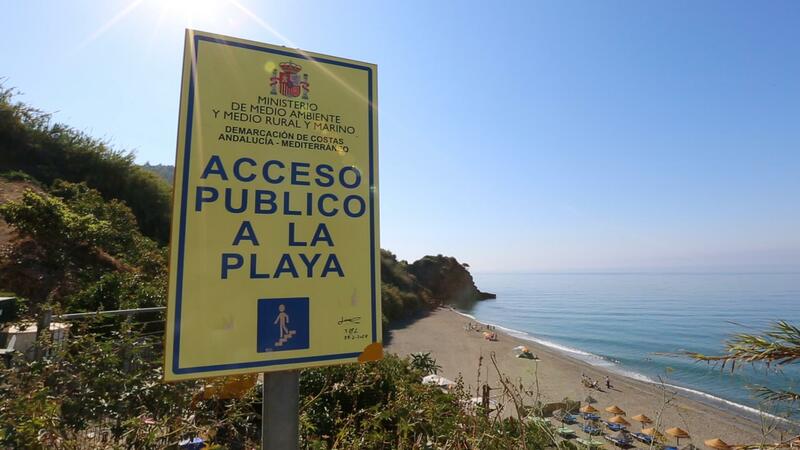 Only a few kilometres outside Nerja on the old N-340 coastal road, the village of Maro sits within Nerja’s municipal boundaries, as such, the beaches of La Caleta and Maro are considered to be Nerja beaches. The beach itself is a mixture of pebbles and coarse sand and runs for approximately 500m. Average width is around 20m. Rent a beach villa near the picturesque coves of Maro, wedged between cliffs, agricultural land and overlooking the remains of an old Moorish watchtower. In 2013, a poll by the Spanish television channel, Antena 3, voted Maro beach as the best in Andalucia and it came in second overall for the whole of Spain; with La Granadella beach in Javea, beating it to first place. You couldn't hope for a more idyllic location. The cove-like beach borders the Los Acantilados de Maro - Cerro Gordo Natural Area, a coastal strip that is rigorously preserved and includes a protected zone that extends out to sea. No fishing is allowed within the area and over the years, this has led to an explosion of marine life. It never ceases to amaze how many fish you'll see the abundance of fish, combined with exceptionally clear waters, makes it one of the best locations in Andalucia for snorkelling and diving. Snorkelling off Maro Beach can be enjoyed by the whole family, with most of the best spots within easy swimming distance from the beach. Just put a mask on and put your head underwater, you are almost guaranteed to see some life. Goes to show you what a little more protection would do to enhance some of the other areas along the coast. One highly recommended activity is sea kayaking the route between Burriana and Maro, exceptionally beautiful and non-technical. There are several rivers that finish their course here, producing some spectacular waterfalls. The largest being the Cascada la Doncella and the Cascada Grande de Maro. The porous limestone rock, the same rock that has lead to the creation of the nearby Nerja caves produces some breathtaking natural scenery. Jagged rocky outcrops, underwater caves and caverns and plenty of interesting formations that make any kayaking trip an unforgettable experience. From Maro’s beach, you can rent kayaks by the hour from the Competa-based Salamandra multi-adventure company (952 553493 - malaga-aventura.es). They charge 7.50€ an hour, or you can take a guided tour - around 20€ for two-three hours. They also offer SUP - Standup Paddle - and lots of other activities. Be sure to check them out and give it a try - you won’t be disappointed!! As far as amenities go, you have everything. There’s one kiosk, a restaurant, sunbed rentals, disabled access, showers, toilets and lifeguards during the summer months. If you driving from your holiday rental in Nerja, take the old coastal road, the N340, and come off at the exit for Maro. Drive through the centre of the village and just before the slip road that takes you back onto the N340, you'll come to a roundabout. Take a sharp right here and follow the road downwards. Keep going straight, following the road as it winds around, going past several greenhouses and farms (this area is well known for its organic produce). You start getting glimpses of some spectacular coves as you drive down. Keep following this road downwards. The road drops steeply towards the beach, and there are normally cars parked along the side of the road. Parking is never usually too much of an issue. If going at the height of summer and on a weekend, you may need to park nearer the top of the hill and walk down. There are 'parking attendants' who expect a contribution - normally around a Euro. Have a great day out on one of Andalusia's most spectacular beaches!! Welcome to Maro beach, a natural paradise that sits a few kilometres east of Nerja it is famously one of the best beaches in Andalucia. Spain's second best beach has a lesser known and more beautiful relative.